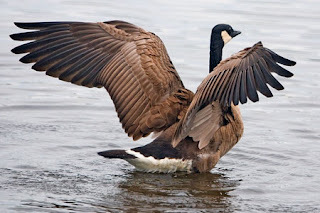 I'm of the opinion that the best feathers for making kulmusim come from the first five feathers on either wing of the wild Canada goose which have been naturally molted from a mature bird. They're strong, have much longer barrels than turkey quills, need much less resharpening and one such quill, properly tempered, can last for months of full-time writing. These quills do however require a much lighter touch than say turkey quills. Next best, I think is the Toulouse goose. These birds often reach 25 lbs or more and produce very large feathers. Because they're raised in captivity their feathers seem to be not as strong as those of birds which fly. Nonetheless, their quills are highly desirable and make fine, long wearing pens. The average white domestic goose has potential, but seldom is allowed to reach a size, or an age where it's quills are large, or hard enough. I don't know how this would be but someone told me tonight that the Kol Yaakov writes that there is a shita that holds a Megillah has to be written c'sidran. I looked through the sefer on Siman 691 but didn't find anything. I made a search on the sefer as well for the word "כסדרן" on Hebrew Books and nothing came up in that Siman. If anyone knows where this is or has any idea who else might bring it down, please share! Thanks! A "Tav" was written instead of a "Hei". The sofer before erasing the regel of the Taf put down something on the klaf to soak up the dio a little that it should be easier to erase. After doing so he saw that the "reish" part of the taf had also lost a bit of it's color and before erasing the regel re-wrote the reish part. Is this considered Nictav b'psul? Since that chelek was written b'kashrus, only the regel makes the ois pasul he only has to erase that. However now before erasing the regel he re-wrote the reish with the regel there in place. Maybe this is not called "Nictav b'psul"? There was seemingly enough dio still (and dark enough) that it would be considered Kosher. However maybe writing over it makes a problem now. I came a across a mezuzah case, where it slides off the rack, this is to allow easy access to have it checked without the pain of having to put new wholes in the wall. It is a special patented invention, sounds cute and smart, however this is not an adequate setting to the doorpost which halacha requires. See Yoreh Deah 189:4- that one should affix a Mezuzah with nails, (as to make it permanent). Note, that the blessing we recite is "Likboah Mezuzah"... to set a Mezuzah (scroll)- showing that it should be made on a permanent way. It is self understood that one could not make a bracha on seting such a case either. Now it is shown to me that this case was already mentioned in the Sefer Pischei Shearim p. 334 that it is not kosher.